After making my little Christmas Tree Brownie Bites and Christmas tree cupcakes with lights made of sprinkles, I wanted to create a Christmas tree light treat all it own. While looking at a picture of a Christmas light, the idea came to me immediately... strawberries and mini marshmallows! I now tend to see items and break them up in to shapes that I can match to the shape of a candy or food since I've been blogging so long! Anyway, I was really happy to make these and take a break from the all the baking ans sugary desserts that this time of year brings. 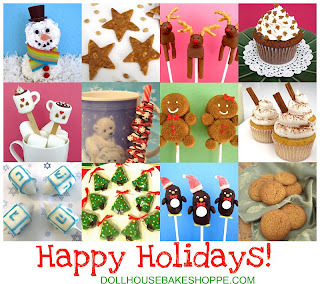 These are a great snack to serve at a holiday party and are really tasty! Cut the stem/leaves off of your strawberries (don't cut too big of a hole). Skewer mini marshmallow onto picks, about an inch up. Dip marshmallow in a bowl of water and then roll into yellow sugar sprinkles, coating entirely. The sugar will stick to the wet marshmallow and the dye from the sugar will color the marshmallow yellow. Push the strawberry onto the pick, pointed side out. Dip the strawberry in a bowl of water and then roll in red sugar sprinkles. The sugar will stick to the wet strawberry. Display your "lights" on a platter, or line them up with green ribbon coming off of each pick to look like a line of Christmas lights! Enjoy! These are a real crowd pleaser. I love the crunch of the sugar with the juicy strawberry! 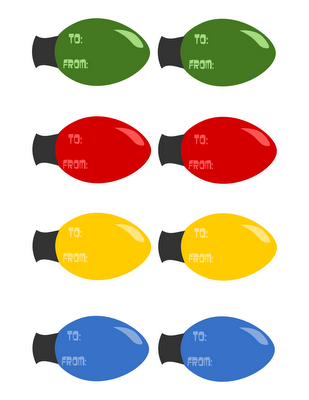 For more Christmas light fun, check out these cute To/From tags by Tricia Rennea Illustrations. Just print, punch a hole in the side of the tag and tie them with ribbon to your gifts or holiday treats like our Christmas Tree Brownie Bites , for an adorably festive packaging idea!